Our New Year's Eve tradition is to burn a bayberry candle A Bayberry Candle. 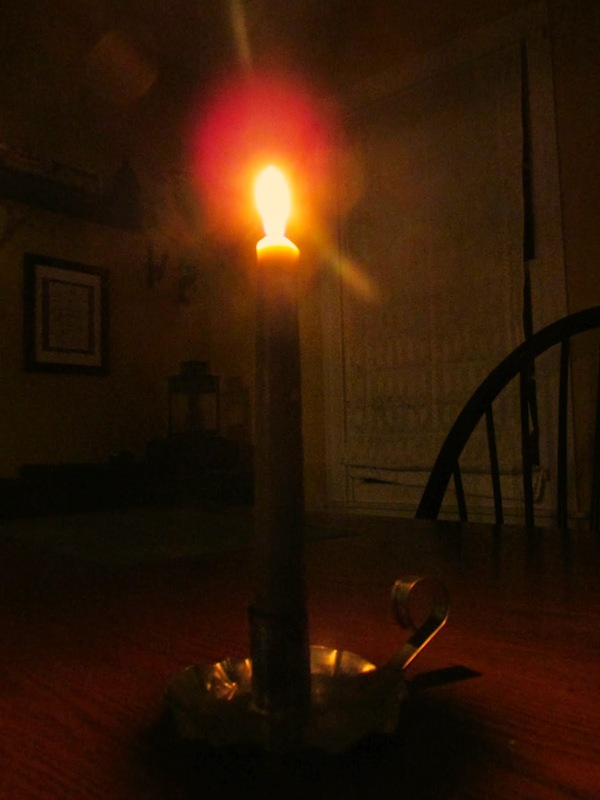 As they say, a bayberry candle "burned to the socket brings Luck to the household, Food to the larder and Gold to the pocket." It's a fun and simple thing to do. I love how it symbolizes a fresh and shiny new year ahead, filled with good things. Last winter we all discovered our love of "afternoon tea!" February was the perfect month to cozy up with a steaming cup of tea, some yummy treats and a stack of read-alouds. So that's exactly what we did. March was one of the most difficult months of my life. I miscarried my baby boy,very suddenly at 18 weeks. A few weeks later, one of my best friends and her family moved away. But, as I looked through my folder of March photos, I was struck by this picture. It's a Pileated Woodpecker. I'm a self-proclaimed "bird nerd" and have always wanted to see one of these birds in my yard, but never have. One day, not long after my miscarriage, this beautiful bird visited our yard for the entire day. Even in my saddness, I remember the thrill of watching this happy bird pecking away at our silver maple. It serves as a reminder to me, that even right there, in the midst of trials, there are still moments of joy and blessing, if you keep your eyes open. Aaaaaah, Easter. Spring was such a balm to my hurting soul last Spring. The return of all things green and living, and warm fresh breezes wafting through windows was exactly what I needed. We had a beautiful Easter, complete with egg hunts, good times with family and baskets brimming full of goodies. 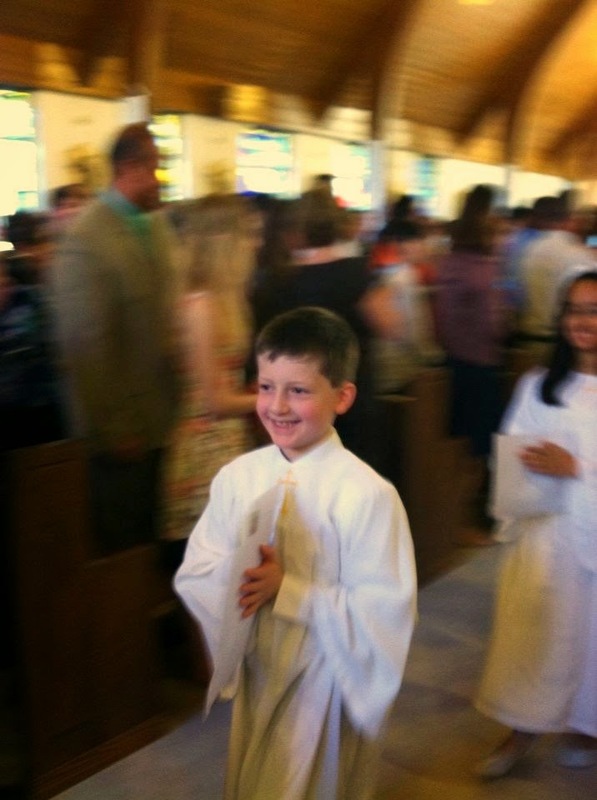 May was an exciting month for us, as Luke made his first Holy Communion! I love this picture in particular, even though it's blurry, because of his beaming smile as he walked down the aisle of the church. Every summer our family vacations at the Outer Banks, NC. It's always a wonderful time, and this year was no exception. The weather was hot and sticky on this particular day, and Kevin and the boys got stuck at the top of the lighthouse for over an hour (!! ), but it was still great fun. 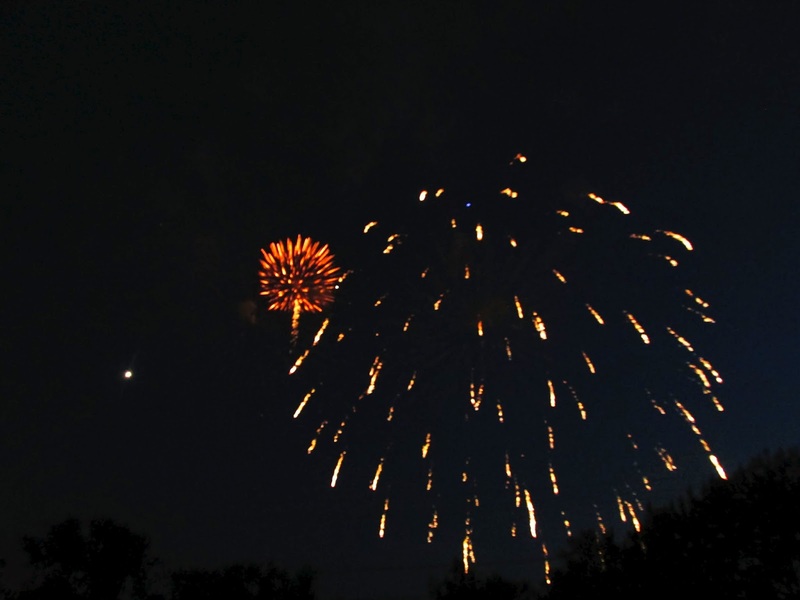 July conjures memories of warm summer nights, BBQ and...fireworks! Our family had a great time watching the fireworks display on the July 4th. It was a night of sticky juice box spills and goldfish cracker feasts, on a damp too-small quilt. We waited in parking lot traffic for almost an hour afterward. But it was totally worth it, in order to see the kids faces light up brighter than the display across the sky. Looking back on August, I remember spending tons of time outside in the backyard gardening, while the kids climbed trees, splashed around in the kiddie pool and dug up bugs. I remember how thrilled the kids were to find this little guy hiding out in the garden shed! 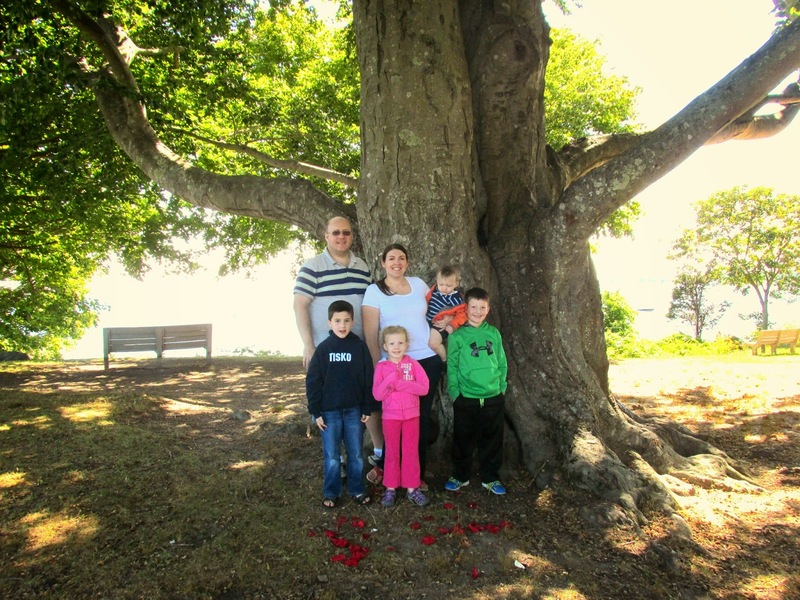 This photo was taken at a Labor Day picnic at the beach. The weather was perfect and we all had a blast visiting with family, squeezing out every last drop of summer sunshiny goodness this bright September day. 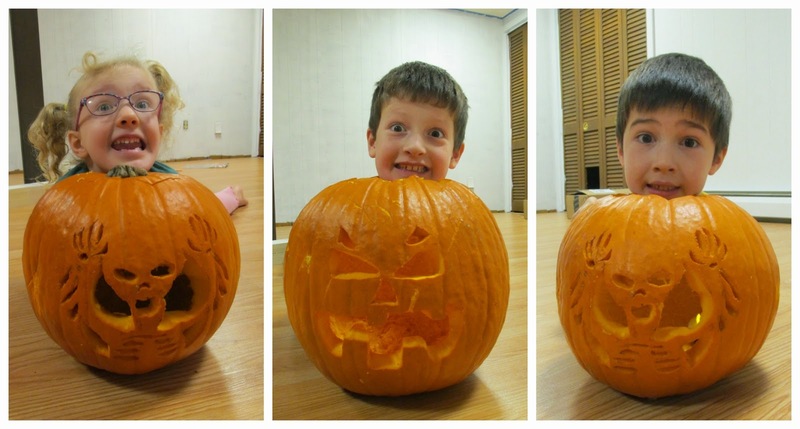 I remember how much the kids and I laughed hysterically when I accidentally photographed Adam with his jack-o-lantern in a way that made it look like he was IN his pumpkin! After that, we decided we just had to snap pics of Luke and Megan "inside" their jacks, too! (For some reason we couldn't seem to get Megan's quite right, though!) Too funny! Around the beginning of November we started seeing a group of turkeys (technically called a "rafter"of turkeys. There's your nerd fact for the day!) pass through our backyard, nearly every day. I found it was so fitting that they started showing up around Thanksgiving! 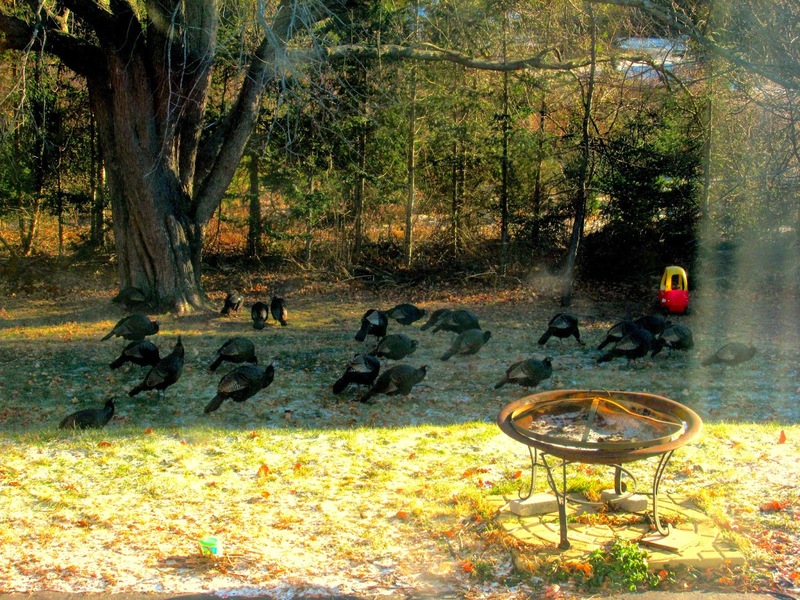 Ever since, we've been enjoying our morning turkey-spotting ritual! Whoever notices them first shouts "Turkeys!" and we all drop everything and run to the window to see how many there are. On this particular day there were almost 30 turkeys out there! Christmas morning excitement! Need I say more?! So, that's my year in photos. It was so nice to take a look back and really see all of blessings--even during the difficult months. 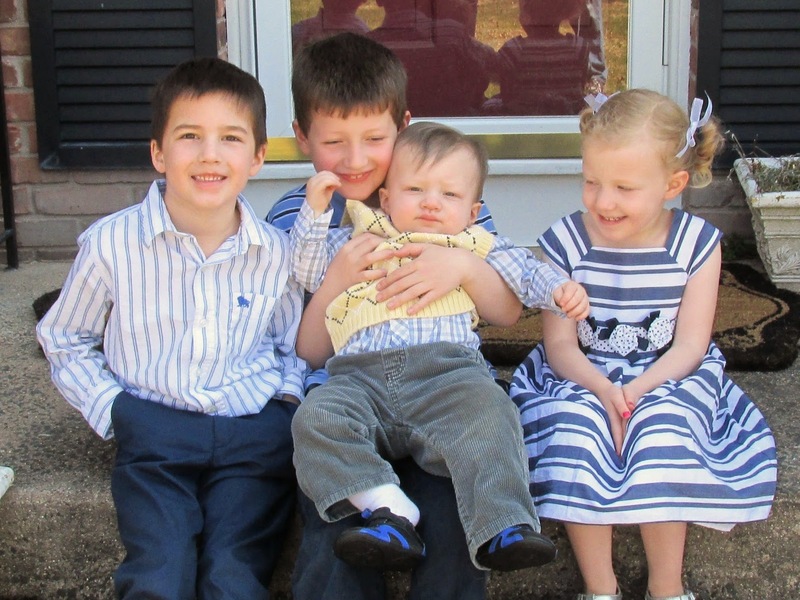 And it struck me how much the kids have grown in a year--how does it happen so fast?! Sharing my photo re-cap over at House Unseen. Keep doing awesome would like to see more blog entry on the site. I have not been this thrilled by a blog entry for a long while! You have it, whatever that implies in blogging.Well, I’m absolutely delighted I establish it and I’ll be bookmarking it and read-through back over and over again! I have a blog and now i attempt to change something there. i don't realize what the mean and what would i be able to do with them. I want to do some changes on my writing blog.